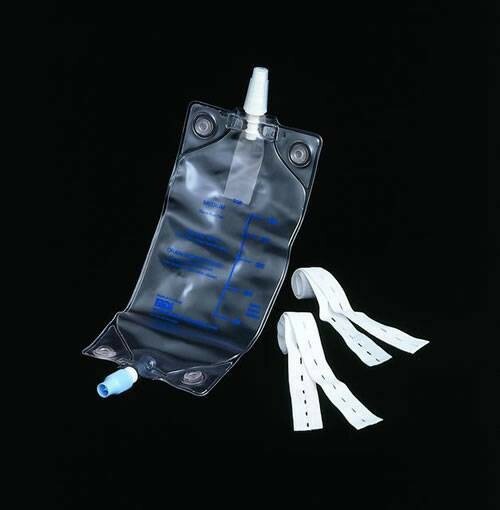 Leg Bag Deluxe Style with Latex Straps feature an anti-reflux valve and a convenient twist-open bottom drain. Four built-in buttons make attaching leg bag straps simple. Heavy vinyl film for durability and odor protection. I love the buttons on the 4 corners. It stays put and does not slide/scrunch up. This cath bag is better than I expected at the price. If you need a cath bag, this is a good one. I have some urinary problems and I use these leg bags. This leg bag is designed by utilizing heavy vinyl film for durability and odor protection. On the plus side of this product is that the straps are very comfortable. It has twist-open bottom drain. It is very easy to drain and it can be obtained in 600cc and 800cc. This one fits me. I like the way it looks, with all those buttons, it 's all simple to fix and use. I love how it is very discreet. It is easy to drain even in public bathrooms. Just remove the cap and the urine will flow. This is the no fuss leg bag! The shape, comfort, straps, and thickness of the bag was great. It is difficult to find a leg bag that is a good size without being too long or too small. I ordered the 800cc thinking that it would be perfect length, since 500cc's are too small and the 1000cc's are too long. However, the 800cc bags I ordered are actually 1000cc bags sold under the 800cc label; at least I what i suspect is true because the bags have the 1000cc scale on them. Although they are 1000cc's, the wider shape made the bag a bit shorter than typical1000cc bags we've tried. Overall - the bag is good, my mother very satisfied with it - I just wish I could find a true 800cc leg bag - to fit her thigh.